Bias And Balance Of Republican And Democratic Voices On The 'Fiscal Cliff' : NPR Public Editor A look at the proportion of Republicans and Democrats speaking on air in relation to the "fiscal cliff" offers an insight into political bias by NPR. The finding? A pretty even balance, despite a slight Republican tilt in the numbers. But further dissection welcomed. 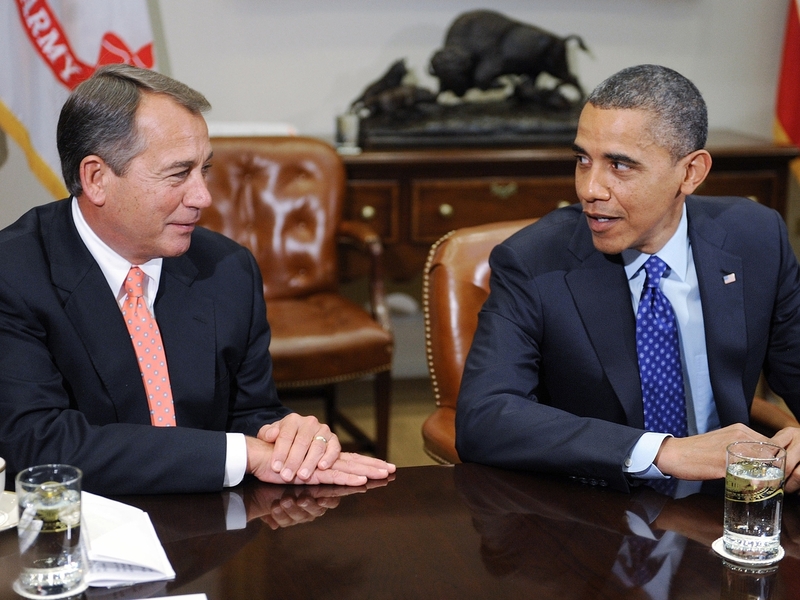 President Barack Obama and Speaker of the House John Boehner met to discuss the impending "fiscal cliff" on Nov. 16, 2012. Arthur Price of New York City asked this provocative question: "Is it my imagination or is NPR featuring an excessive number of Republican voices when it comes to the so-called 'fiscal cliff'?" I didn't know, but I loved the issue he raised. Its relevance in influencing today's fierce tax and spending debate as we approach the Jan. 1 supposed "cliff" is obvious. But perhaps even more interesting, I thought, was the insight it might offer into political bias by NPR in general. The "cliff" debate is particularly appropriate to study. The matter before the country of deciding on whether and how to raise taxes and cut government spending is fundamental to citizenship and therefore news media coverage. That the nation is divided roughly evenly between conservative and liberal policy prescriptions presents a clear coverage challenge. Any foregone conclusions on bias are dangerous. General complaints from the right about a liberal tilt by NPR are often so loud that most people I meet assume that they occupy most of my time. People are usually surprised when I tell them that I in fact get just as many, if not more, complaints from the left claiming that NPR favors conservatives. I asked our intern, Laura Schwartz, to listen to all the stories dealing with the "fiscal cliff" since Election Day and tally the affiliations of the people interviewed and quoted on air on NPR-produced programming: Morning Edition, All Things Considered, Talk of the Nation, Tell Me More, Weekend Edition, and Weekends on All Things Considered. A raw count can be misleading. It does not reflect the amount of actual air time each side gets or the tone—vitally important to radio—set by NPR's reporters and hosts. But my sense from listening to the "cliff" coverage is that the tone has been generally straightforward, and I heard no obvious exaggerations in the amount of time given one side versus the other. So, we looked at only the voice count, which is easily measurable and, anyway, was the subject of the complaint by Price and others. Outside voices on air are powerful in selling one side or another. Schwartz found 239 instances of voices heard in news stories, interviews and discussions between Nov. 7 and Dec. 6 in connection with the upcoming Jan. 1 deadline, when tax increases and budget cuts automatically go into effect if the president and Congress don't reach an alternative agreement. (That this really isn't a "fiscal cliff" was the subject of my last post.) The following chart graphically shows Schwartz's results. Proportion of Republicans and Democrats interviewed or quoted on NPR-produced shows, Nov. 7 – Dec. 6, in connection with the "fiscal cliff"
What I see is a see-sawing from day to day on which voices are heard most. On the blank days, listeners did not hear voices clearly advocating one party or another. The aggregate number, however, indeed favors the GOP. Schwartz found 94 voices that clearly were Republicans — they were usually introduced as such — versus 77 clear Democrats. Over the course of the month measured, this amounted to one more Republican voice every two days or so. Is this significant? And does it prove that NPR listeners are hearing from an "excessive" proportion of Republicans, as Mr. Price alleged? I don't think so. The difference was additionally diluted by 68 voices we classified as "other" because they were introduced either as nonpartisan or there was doubt as to each person's political affiliation. There could be many justifications based on news value, moreover, for the slight imbalance. The Democrats are united behind President Obama, for example, but the Republicans are divided. And they are under the greatest public pressure in polls to compromise, making them more newsworthy to follow. In fact, the major political question at the moment appears to be how much Republicans eventually will concede to the president. We also didn't look at which Republicans and Democrats were quoted on air and where they fell on the ideological spectrum. In particular, many progressive Democrats to the left of Obama and outside Congress complain about not being heard in the current debate. Far-right Republicans are strongly represented in Congress, and so their voices are prominent, if not always heeded these days. Still, the voice count is a first cut in a bias analysis. I put it out there for your consideration and further delving. Intern Laura Schwartz contributed to this post.